Massage, best known antidote for stress-related tension reduces tension, gives you more energy, improves your outlook on life and can reduce your likelihood of illness and injury. Massage acts directly on your muscles with stretching and kneading motions. It stimulates the nervous system and instructs the muscles to relax. Massage is great after a workout! By flushing muscles of built-up waste products, massage decreases soreness after vigorous exercise. It can treat injuries such as muscle strains and tendinitis. It reduces inflammation by stimulating the circulatory and lymphatic systems to bring nutrition to the injured area and remove waste products. Massage realigns collagen fibers which misalign in the formation of scar tissue, making the tissue more pliable and allowing for an increase of range of motion, and decreased pain. Massage can help enhance body awareness, and improve your health in many ways. It is an effective and recognized modality for maintaining your body and health. 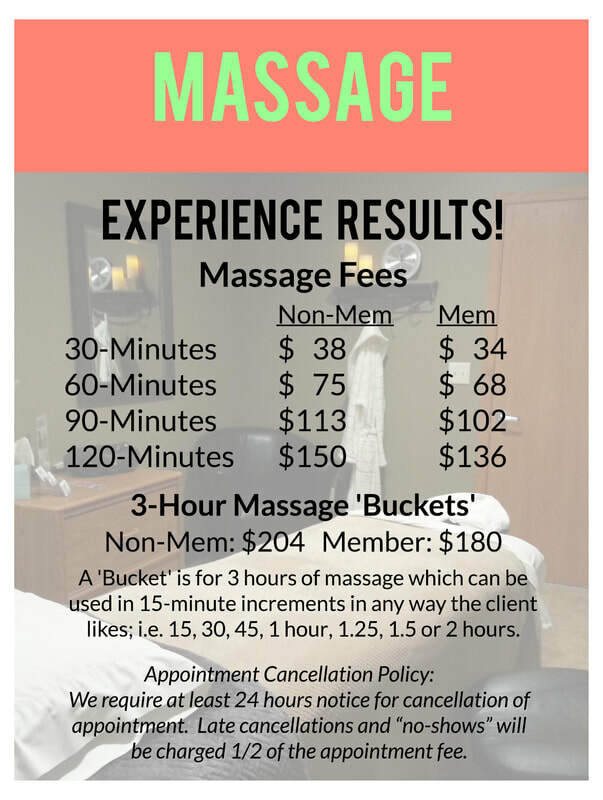 A one hour massage is the most common, however, you may request a longer or shorter session. One hour is enough time for a deeply relaxing, full-body massage or a more in-depth treatment of a particular area (i.e.the neck, back or shoulders). More frequent 1/2 hour massages are helpful in injury treatment. Undress to your comfort level. The practitioner is sensitive to your need for privacy and will keep you covered with a sheet, un-draping only the area being massaged. Close your eyes and allow yourself to relax as completely as possible. Focus on your breathing...slow, deep and even. When the practitioner’s hands locate an area of tension or pain in your body, consciously relax those areas. As you exhale, visualize the tension leaving your body. Reflexologists believe a map of the entire body is duplicated on the feet and hands. Reflexology is a non-invasive, complimentary discipline involving the use of alternating pressure applied to the flexes found within these reflective maps. The physical act of applying specific pressures using thumb, finger and hand techniques results in relaxation which, in turn, causes physiological changes in the body. Promotes stress reduction throughout the entire body, promoting relaxation. Naturally promotes balance and normalization through the relaxation process. Stimulates circulation and the delivery of oxygen and nutrients to the cells. Book an appointment with our providers Kim Chambers and Toddi Barclay now! We require at least 24 hours notice for cancellation of appointment. ​Late cancellations and “no-shows” will be charged 1/2 of the appointment fee. ANJA PETTERSON, is a 2010 graduate of the Wellness School of Massage. She is a Spokane native who recently relocated to the Wenatchee area with her husband has extensive training in massage includes techniques in deep tissue, sports rehabilitation, myofascial release, trigger point, cranial sacral therapy and prenatal massage. Anja is also a UESCA certified running coach. When Anja is not treating patients, she can be found running trails high in the mountains competing in ultramarathons-a sport that combines her love of the outdoors and running long distances. With over 15 years of experience in the sport, she's competed in a variety of distances and terrain… from track 5000 meters to 100k ultra distances, from fast road 10ks to high altitude sky races. Because of her love of running and therapy, she enjoys working with all experience levels as well, from someone new to the sport to a seasoned athlete who wants to run more efficiently and effectively. Anja will normally be available for appointments 9 am - 5 pm Monday - Friday. Call the desk to book today, 662-3544. TODDI BARCLAY, is a ​Massage Therapist and Reflexologist. She and husband, Brian, moved to the Wenatchee Valley in 2004 with their two children, Hudson and Quinlee. They love adventures in nature like hiking, kayaking and most everything else outdoors. Toddi grew up with a Chiropractor for a father on a boat docked at Orcas Island. Keeping with the peace of the small island, she moved a few times and traveled as much as possible. ​She found a new career love with massage - practicing since early 2016 - and is looking forward to many more years of learning how to help others. She offers evening appointments on Mondays 5:30 and 6:45 and Thursdays at 4:15 and 6:45. Call the desk to book today, 662-3544. KIM CHAMBERS is a Massage Therapist, Reflexologist and Esthetician. She graduated from Columbia River Institute of Massage Therapy, where she received her certification in Massage Therapy. She continued her education in Reflexology. Kim offers therapeutic, deep tissue, hot stone, pregnancy and cupping massage services. ​ Kim also attended Academy of Hair Design where she received her Esthetics certification. ​She has a passion for making people feel the best they can be. Call the desk to book today, 662-3544. ​I have suffered for many of my 67 years with an arthritic back. And because of too many years playing too much racquetball I also have been blessed with sciatica and a total knee replacement. Several weeks ago I somehow added a strained a flank muscle into the mix. Because I have a tendency to be a bit overzealous in my approach to exercise, I am very familiar with all sorts of medical treatments and have tried every medicine, therapy and machine known to modern (wo)man to feel better. None helped. I finally called the WRAC in desperation to see if a massage (the one thing I hadn't tried) would ease any of my very real pain. They booked me into an hour slot with a new masseuse named Anja. Never having this experience before, I didn't know what to expect. But I toddled in, laid down and was rubbed, pressed and drilled repeatedly from my neck to my knees. Holy elbows, I was cured! My back has never in my adult life been this relaxed and supple. All pain is gone, I can walk upright, twist and turn, and haven't stopped smiling!